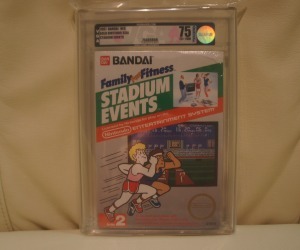 A sealed copy of the ultra-rare Stadium Events for the NES games is currently listed on eBay for $21,700. California based seller, *feedback*, has said that 10 per cent of the proceeds will go to the Japan Earthquake and Tsunami Relief Fund. Stadium Events holds the world record for the most amount of money paid for a game at $41,300 and is described as the ‘Holy Grail of the NES games’. *feedback* claims this is the only new and verified copy of Stadium Events in existence. At the time of publication, the copy of Stadium Events had 51 bids and the reserve is not currently met. The game’s rarity is due to it having been recalled by Nintendo in 1987 after it purchased the rights to the Family Fun Fitness pad, the peripheral that the game was designed for. Very few copies of the game survived, making it incredibly rare. The copy of Stadium Events is up for auction until the 20th March, and you can check out the listing for yourself. If you do happen to be a super-wealthy NES collector, best of luck with your bidding. Love the fact that rare games can be worth so much? Or do you not see the point of collecting classic games at all. Either way, let us know here. Dan here I'm 19 years old and tech is my thing :) This is my first time I have made my own website and I'm hoping to develop it. i think it was a wordpress theme not sure. The right panel of you blog shows up all squished! i’m using Firefox if it helps.